(Natural News) Although sweet potatoes are an important staple food for Thanksgiving and Christmas dinners, this versatile, orange root tuber can be added to many other meals all year round. While sweet potatoes have been used for ages by many cultures around the world, until recently they weren’t a regular sight on American kitchen tables outside of the Holiday season. In the past decade, however, the sweet potato has found its way to our hearts. According to the Agricultural Marketing Resource Center, the root vegetable’s popularity has skyrocketed between 2000 and 2014, with its consumption increasing by nearly 80 percent. And for a good reason; sweet potatoes pack a powerful nutritional punch. They are loaded with essential micronutrients to promote overall health and have fewer calories than ordinary potatoes. Essential nutrients found in sweet potatoes include fiber, protein, beta-carotene, vitamin C, manganese, potassium, and many vitamins of the B-complex. What’s more, you actually don’t need a big garden or a lot of space to grow your own supply of sweet potatoes. Read on to find out how to grow sweet potatoes at your home. Select the right sweet potato – Rooted sweet potatoes will give you the best result since you can be sure that they are not treated with pesticides to stop the sprouting process. 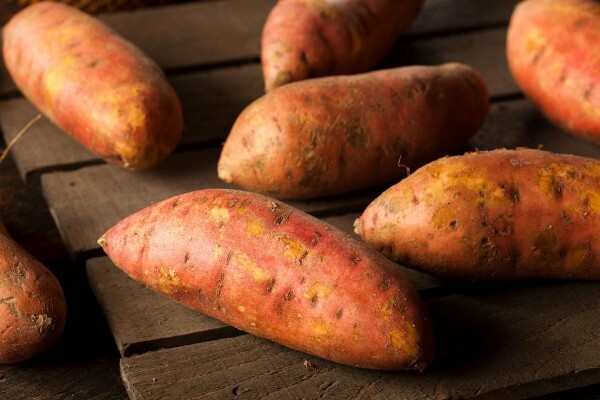 Create some heat – Unlike regular potatoes, sweet potatoes love the heat. While sweet potatoes will still grow at a minimum temperature of 50 °F (10°C), they seem to do much better at room temperature. So, if you live in a colder climate, make sure to keep them indoors. Prepare a 5-gallon bucket – Once you have selected the right sprouted potato, fill a container that has draining holes in the bottom with moist soil. Plant one potato per 5-gallon bucket, tops exposed. Waiting for “slips” to emerge – After a while, green shoots or slips will start to grow out of the sweet potato. This step will take about 90 days. Transplant the slips – Once the slips are big enough, about 6 to 12 inches, it is time to gently remove them from the sweet potato and transplant them to a larger 20-gallon container. In each 20-gallon container, you can plant six sweet potato slips. Pick the right season – As mentioned before, sweet potatoes are a heat-loving plant. If you are planning to grown them outdoors, make sure the last frost of spring has already passed. Late spring is the ideal time of the year. Also, make sure they stay well-watered. Harvest time – After about 3 to 4 months – or when the leaves and vines start to turn yellow – you can start digging up the sweet potatoes. If you grow outdoors, this is usually just after the first frost. After digging up the sweet potatoes, shake off any excess dirt, but do not wash them with water as sweet potatoes need a curing process to create their delicious, sweet taste. Cure sweet potatoes – Next to enhancing their flavor, curing allows a second skin to form over scratches and bruises you made while digging up the potatoes. This protective layer makes it possible to store sweet potatoes at room temperature for up to a year. To cure, store the harvested tubers in a warm, humid place (80°F or 27°C) for two weeks.